Many nights are selling out. Get your tickets today! By popular demand, NightGarden has added 3 additional dates, culminating with our final show of the season on Friday, January 11! This holiday season, a world of enchantment comes to Fairchild Tropical Botanic Garden. Come inside the magical NightGarden, where the Tree of Wisdom talks, fairies fly before your eyes, and dandelions are 10ft tall. Take this unbelievable journey with the whole family and watch magic unfold. The enchantment starts November 23, 2018 and ends on January 11, 2019*. To learn more, please visit thenightgarden.com. If you'd like to book tickets for groups of 21 or more, please contact info@thenightgarden.com. Buy online and save $2 per ticket! *Open select dates 6PM-10PM Sunday-Thursday, 6PM-11PM Friday-Saturday. NightGarden is CLOSED on 11/26, 27; 12/1, 3, 4, 9, 10, 11, 24, 27, 29. All sales are final. No refunds. Event is rain or shine. Date exchanges can be made at the Box Office for a $5 fee. Children 2 and under are Free. Active Duty Military receive Free admission on any night of opertation (except for 12/31) with a Valid Military ID shown at the Box Office. The NightGarden is only open at night and because it is an outdoor area immersed in nature it can be dark in some areas. 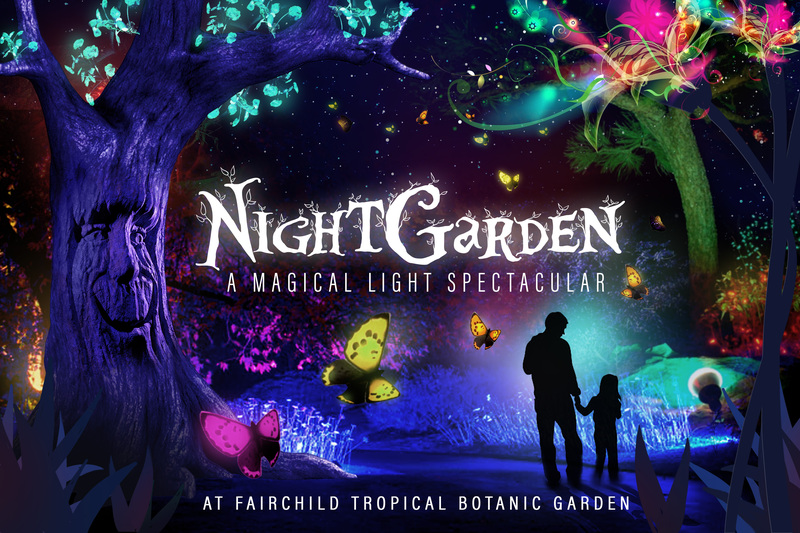 Neither NightGarden nor Fairchild Gardens will be liable for any harm or injury to any person at the Fairchild Gardens, nor for any loss or damage to any belongings or property. Each guests enters the premises at their own risk. Furthermore guests are strictly prohibited from climbing on any trees, destroying any plant or pathway, touching any of the video activations, or disrupting other guests experience and may be asked to leave by management if found doing any of the foregoing.